"Beauty with an Eco-Conscious Mind". Our top priority is ensuring our guests have the most wonderful hair experience possible without comprising their own health and the environment so they can feel gorgeous inside and out. We genuinely care about our guests, staff, and maintaining a beautiful planet. Our mission is to bring a little inspiration to all those around us. We strive to maintain integrity in all we do. Making daily decisions to look after our planet, our people, and communities. 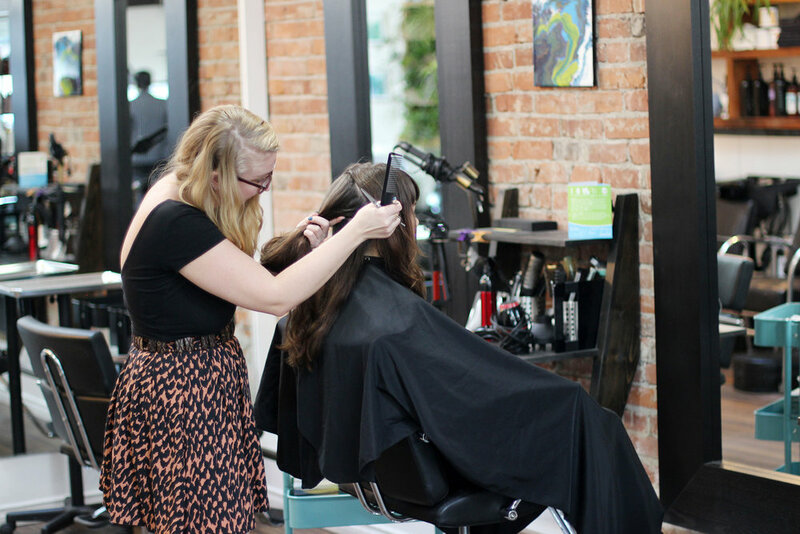 Using eco-friendly products and design, hiring educated stylists, carrying certified organic products and ammonia-free colour, and striving to provide you with the best customer service. We are committed to making your visit the greatest one possible. Inspire Hair Design is a certified member of Green Circle Salons. Two years in a row we have won the Eco Star Award for Greenest Retail Store. We recycle, re-use, redirect, re-claim or repurpose practically everything: paper, plastics, compost, left over colour and tubes, Hairspray cans, foils, and even hair clippings. In fact, hair clippings collected by the Green Circle Salon program are turned into oil booms used to contain marine oil spills. We choose products for their beauty-enhancing as well as eco-friendly properties. Your skin and hair won’t be exposed to harsh chemicals during your appointment. Using environmentally friendly products means chemicals such as ammonia, parabens, and sulfates are kept out of water systems and landfills, too. We do our best to create a positive, relaxing, and friendly environment to make your experience as pleasant as possible. Expect to be pampered with a shampoo and scalp massage, guest-focused styling and treatment, dark chocolate, and beverages. A variety of magazines and complimentary wifi are provided to allow you to stay current or to stay connected with family and friends. If you prefer to leave the outside world behind you, sit back and relax with a freshly made cup of warm fair-trade coffee or one of our delicious Silk Road teas. Inspire Hair Design is located in the heart of beautiful downtown Victoria B.C. You will find us on Blanshard Street between Broughton and Fort Street. For the last 6 years we have welcomed clients from all around Victoria, Vancouver Island and around the world. Whether you live locally or are here on holidays, we would love for you to stop in, or stay a while.